Summary of Case: A priest of the Lansing diocese ordained in 1955, Sullivan was elevated to Auxiliary Bishop in 1972, then to Bishop of Fargo in 1985. Sullivan was accused in 2002 of fondling a high school-aged boy in 1966, after the boy disclosed to him that a religious brother had sexually abused him. Sullivan denied the accusations, and diocesan officials stated they did not believe the accuser because he had not come forward sooner. Sullivan retired in March 2002 due to symptoms of Alzheimer's disease. He died in June 2006. Lansing bishop was Joseph Henry Albers (1937-1965). 1958 St. Luke's Flint MI 2/2 St. Luke's had a school with 571-712 students. 1958 1960 St. Mary's Cathedral Lansing MI 5/7, 6/8 St. Mary's had a grade school with 404-340 students, and a high school with 443-357 students. 1960 1961 Secretary to the Bishop Lansing MI Sullivan's address is that of the bishop's residence in the 1961 Directory. 1961 1965 St. Joseph's St. Joseph MI 3/3, 2/3 St. Joseph's had a grade school with 519-543 students, and a high school with 182-247 students. • Sullivan was accused in 2002 of fondling a high school aged boy in 1966. His accuser said he went to Sullivan to report that a religious brother molested him. He said Sullivan told him to keep quiet, and molested him a week later. The accuser also said that Sullivan told him he had two options, "Either join the club, or shut-up." Sullivan denied the accusations. The incident is said to have happened at St. Thomas Aquinas in East Lansing, where Sullivan served as a fill-in priest from time to time. Resurrection had a school with 705-239 students. Sullivan was appointed Auxiliary Bishop July 25, 1972, and ordained bishop Sept. 21, 1972. St. Thomas' had a school with 376-468 students. 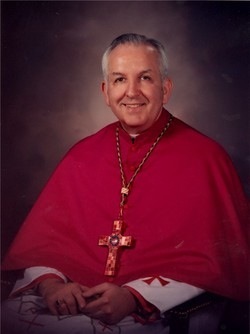 Sullivan was appointed Bishop of Fargo April 2, 1985, and installed May 30, 1985. Sullivan retired in May 2002, and was said at the time to have been in the middle stages of Alzheimer's disease. Of the 2002 accusation that Sullivan had fondled a boy in 1966, church officials said they did not believe the accuser, "because he didn't tell them sooner." The accuser said he took so long to come forward because he thought no one would believe him. 2006 Holy Spirit Fargo ND In residence. This assignment record collates Sullivan's career history as it is represented in the Official Catholic Directory with allegations as reported in the media. We make no representation regarding the truth of the allegation we report, and we remind our readers that the U.S. legal system presumes that a person accused of or charged with a crime is innocent until proven guilty. Similarly, individuals who may be defendants in civil actions are presumed not to be liable for such claims unless a plaintiff proves otherwise. Admissions of guilt or liability are not typically a part of civil or private settlements. For more information, see our posting policy.